The first criteria in the SECTIONS model is students. differences in how students learn. One of the fundamental changes resulting from mass higher education is that university and college teachers must now teach an increasingly diverse range of students. This increasing diversity of students presents major challenges for all teachers, not just post-secondary teachers. However, it has been less common for instructors at a post-secondary level to vary their approach within a single course to accommodate to learner differences, but the increasing diversity of students now requires that all courses should be developed with a wide variety of approaches and ways to learn if all students in the course are to be taught well. In particular, it is important to be clear about the needs of the target group. First and second year students straight from high school are likely to require more support and help studying at a university or college level. They are likely to be less independent as learners, and therefore it may be a mistake to expect them to be able to study entirely through the use of technology. However, technology may be useful as a support for classroom teaching, especially if it provides an alternative approach to learning from the face-to-face teaching, and is gradually introduced, to prepare them for more independent study later in a program. On the other hand, for students who have already been through higher education as a campus student, but are now in the workforce, a program delivered entirely by technology at a distance is likely to be attractive. Such students will have already developed successful study skills, will have their own community and family life, and will welcome the flexibility of studying this way. Third and fourth year undergraduate students may appreciate a mix of classroom-based and online study or even one or two fully online courses, especially if some of their face-to-face classes are closed to further enrolments, or if students are working part-time to help cover some of the costs of being at college. Lastly, within any single class or group of learners, there will be a wide range of differences in prior knowledge, language skills, and preferred study styles. The intelligent use of media and technology can help accommodate these differences. So, once again, it is important to know your students, and to keep this in mind when making decisions about what media or technology to use. This will be discussed further in Chapter 9. Of all the criteria in determining choice of technology, this is perhaps the most discriminating. 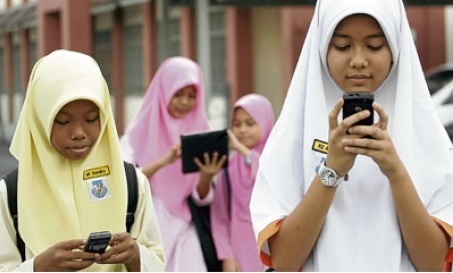 No matter how powerful in educational terms a particular medium or technology may be, if students cannot access it in a convenient and affordable manner they cannot learn from it. Thus video streaming may be considered a great way to get lectures to students off campus, but if they do not have Internet access at home, or if it takes four hours or a day’s wages to download, then forget it. Difficulty of access is a particular restriction on using xMOOCs in developing countries. Even if potential learners have Internet or mobile phone access, which 5 billion still do not, it often costs a day’s wages to download a single YouTube video – see Marron, Missen and Greenberg, 2014.
what is the institutional policy with regard to students’ access to a computer, tablets or mobile phones? can students use any device or is there a limited list of devices that the institution will support? is the medium or software chosen for teaching compatible with all makes of devices students might use? is the network adequate to support any extra students that this initiative will add? who else in the institution needs to know that you are requiring students to use particular devices? what kind of device do they need: one at home with Internet access or a portable that they can bring on to campus – or one that can be used both at home and on campus? what kind of applications will they need to run on their device(s) for study purposes? will they be able to use the same device(s) across all courses, or will they need different software/apps and devices for different courses? what skills will students need in operating the devices and the apps that will be run on them? if students do not have the skills, would it still be worth their learning them, and will there be time set aside in the course for them to learn these skills? what are the educational advantages that you see in student use of a particular device? what will students need to do on the device in your course? is it really essential for them to use a device in these ways, or could they easily manage without the device? In particular, how will assessment be linked to the use of the device? It will really help if your institution has good policies in place for student technology access (see Section 8.7). If the institution does not have clear policies or infrastructure for supporting the technologies you want to use, then your job is going to be a lot harder. The answer to the question of access and the choice of technology will also depend somewhat on the mandate of the institution and your personal educational goals. For instance, highly selective universities can require students to use particular devices, and can help the relatively few students who have financial difficulties in purchasing and using specified devices. If though the mandate of the institution is to reach learners denied access to conventional institutions, equity groups, the unemployed, the working poor, or workers needing up-grading or more advanced education and training, then it becomes critical to find out what technology they have access to or are willing to use. If an institution’s policy is open access to anyone who wants to take its courses, the availability of equipment already in the home (usually purchased for entertainment purposes) becomes of paramount importance. Universal Design for Learning, or UDL, refers to the deliberate design of instruction to meet the needs of a diverse mix of learners. Universally designed courses attempt to meet all learners’ needs by incorporating multiple means of imparting information and flexible methods of assessing learning. UDL also includes multiple means of engaging or tapping into learners’ interests. Universally designed courses are not designed with any one particular group of students with a disability in mind, but rather are designed to address the learning needs of a wide-ranging group. Most institutions with a centre for supporting teaching and learning will be able to provide assistance to faculty to ensure the course meets universal design standards. BCcampus has a very useful guide for preparing web-based materials that meet accessibility standards. Norquest College and eCampus Alberta have published a more detailed guide to ensuring online materials are accessible for persons with disabilities. It may seem obvious that different students will have different preferences for different kinds of technology or media. The design of teaching would cater for these differences. Thus if students are ‘visual’ learners, they would be provided with diagrams and illustrations. If they are auditory learners, they will prefer lectures and podcasts. It might appear then that identifying dominant learning styles should then provide strong criteria for media and technology selection. However, it is not as simple as that. McLoughlin (1999), in a thoughtful review of the implications of the research literature on learning styles for the design of instructional material, concluded that instruction could be designed to accommodate differences in both cognitive-perceptual learning styles and Kolb’s (1984) experiential learning cycle. In a study of new intakes conducted over several years at the University of Missouri-Columbia, using the Myers-Briggs inventory, Schroeder (1993) found that new students think concretely, and are uncomfortable with abstract ideas and ambiguity. However, a major function of a university education is to develop skills of abstract thinking, and to help students deal with complexity and uncertainty. Perry (1984) found that learning in higher education is a developmental process. It is not surprising then that many students enter college or university without such ‘academic’ skills. Indeed, there are major problems in trying to apply learning styles and other methods of classifying learner differences to media and technology selection and use. Laurillard (2001) makes the point that looking at learning styles in the abstract is not helpful. Learning has to be looked at in context. Thinking skills in one subject area do not necessarily transfer well to another subject area. There are ways of thinking that are specific to different subject areas. Thus logical-rational thinkers in science do not necessarily make thoughtful husbands, or good literary critics. Part of a university education is to understand and possibly challenge predominant modes of thinking in a subject area. While learner-centered teaching is important, students need to understand the inherent logic, standards, and values of a subject area. They also need to be challenged, and encouraged to think outside the box. This may clash with their preferred learning style. Indeed, the research on the effectiveness of matching instructional method to learning styles is at best equivocal. For instance, Dziuban et al. (2000), at the University of Central Florida, applied Long’s reactive behavior analysis of learning styles to students in both face-to-face classes and Web-based online classes. They found that learning style does not appear to be a predictor of who withdraws from online courses, nor were independent learners likely to do better online than other kinds of learners. The limitation of learning styles as a guide to designing courses does not mean we should ignore student differences, and we should certainly start from where the student is. In particular, at a university level we need strategies to gradually move students from concrete learning based on personal experience to abstract, reflective learning that can then be applied to new contexts and situations. Technology can be particularly helpful for that, as we saw in Chapter 7. Thus when designing courses, it is important to offer a range of options for student learning within the same course. One way to do this is to make sure that a course is well structured, with relevant ‘core’ information easily available to all students, but also to make sure that there are opportunities for students to seek out new or different content. This content should be available in a variety of media such as text, diagrams, and video, with concrete examples explicitly related to underlying principles. We shall see in Chapter 10 that the increasing availability of open educational resources makes the provision of this ‘richness’ of possible content much more viable. Similarly, technology enables a range of learner activities to be made available, such as researching readings on the Web, online discussion forums, synchronous presentations, assessment through e-portfolios, and online group work. The range of activities increases the likelihood that a variety of learner preferences are being met, and also encourages learners to involve themselves in activities and approaches to learning where they may initially feel less comfortable. Such approaches to design are more likely to be effective than courses in multiple versions developed to meet different learning styles. In any case developing multiple versions of courses for different styles of learner is likely to be impractical in most cases. So avoid trying to match different media to different learning styles but instead ensure that students have a wide range of media (text, audio, video, computing) within a course or program. Lastly, one should be careful in the assumptions made about student preferences for learning through digital technologies. On the one hand, technology ‘boosters’ such as Mark Prensky and Don Tapscott argue that today’s ‘digital natives’ are different from previous generations of students. They argue that today’s students live within a networked digital universe and therefore expect their learning also to be all digitally networked. It is also true that professors in particular tend to underestimate students’ access to advanced technologies (professors are often late adopters of new technology), so you should always try to find up-to-date information on what devices and technologies students are currently using, if you can. the evidence indicates that young students do not form a generational cohort and they do not express consistent or generationally organised demands. Graduating students that have been interviewed about learning technologies at the University of British Columbia made it clear that they will be happy to use technology for learning so long as it contributes to their success (in the words of one student, ‘if it will get me better grades’) but the students also made it clear that it was the instructor’s responsibility to decide what technology was best for their studies. It is also important to pay attention to what Jones and Shao are not saying. They are not saying that social media, personal learning environments, or collaborative learning are inappropriate, nor that the needs of students and the workforce are unchanging or unimportant, but the use of these tools or approaches should be driven by a holistic look at the needs of all students, the needs of the subject area, and the learning goals relevant to a digital age, and not by an erroneous view of what a particular generation of students are demanding. In summary, one great advantage of the intelligent application of technology to teaching is that it provides opportunities for students to learn in a variety of ways, thus adapting the teaching more easily to student differences. Thus, the first step in media selection is to know your students, their similarities and differences, what technologies they already have access to, and what digital skills they already possess or lack that may be relevant for your courses. This is likely to require the use of a wide range of media within the teaching. 4. If students are to be taught at least partly on campus, what is – or should be – your or your department’s policy with regard to students’ access to devices in class? There are many different ways to get the information needed to answer these questions. In many cases, you will still have to make decisions on insufficient evidence, but the more accurate information you have about your potential students, the better your likely choice of media and technology. Almost certainly, though, you will have a variety and diversity of students, so the design of your teaching will need to accommodate this. How many of these questions can you answer off the top of your head? What additional information do you need, and where can you find it? BCcampus and CAPER-BC (2015) B.C. Open Textbook Accessibility Toolkit Victoria BC: BCcampus. 8.2 Students by Anthony William (Tony) Bates is licensed under a Creative Commons Attribution-NonCommercial 4.0 International License, except where otherwise noted.